A fun, light-hearted sword-duelling competition that anyone can join! The way to score points is to put on a good show. Players will be judged on presentation, skill and showmanship. Open to all skill levels, including those who have never held a sword before! Come and play, or just watch the action! The judges will tally your scores and decide the Champion. ​All judges decisions are final. 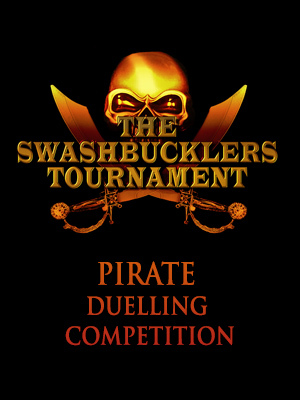 Players will be paired off to fight other players of similar skill levels. Fights go for precisely 1 minute, with a 30 second gong and an end gong. or test your mettle with a fresh opponent on the day. not on whether they 'died' in the last bout. Sign up to the competition on the entry form sign-up sheet at the start of the game. Nominate whether you are beginner, intermediate or advanced, and if you are fighting with a partner. This is a contact sport for entertainment. Participants must be sober and play in good faith. LARP safe swords ONLY. You can use swords provided. If bringing your own sword your weapons must pass a safety inspection by the Games Master. If you need to stop the fight for any reason call out 'Hold'. All action must stop if someone says 'Hold', whether it's a player, a judge, or an audience member. Combat can resume only when the judges say you can continue, after the safety issue has been dealt with. Bouts last for one minute each with time being called at 30 seconds. No attempts to cause actual physical harm or distress to your opponent. Q: Can I enter with my pirate name, e.g. 'Mudwarbler The Terrible' instead of 'Megan'? A: Yes, you sure can. Creativity is encouraged! Q: How can I insult my opponent? A: Creatively. Respectfully. Not personally. Don't attack people for their gender, race, creed. Don't use personal information you may know about them against them. If you'd like some ideas, try googling 'Monkey Island insults'. Ridiculous insults are the best insults. Q: I've never used a sword before. Will I be ok? A: Yes. You can quickly learn some skills if you join the sword-fighting class before the tournament. You may like to watch some good sword-fighting movies, like Scaramouche, Captain Blood, The Princess Bride, Pirates of the Carribean and so on to check out some good moves and stances to copy. Q: Can I use my own weapons? A: Yes, but only if they are approved for safety by the Games Master. If they don't pass safety standards you will be given a LARP-safe sword to use instead.